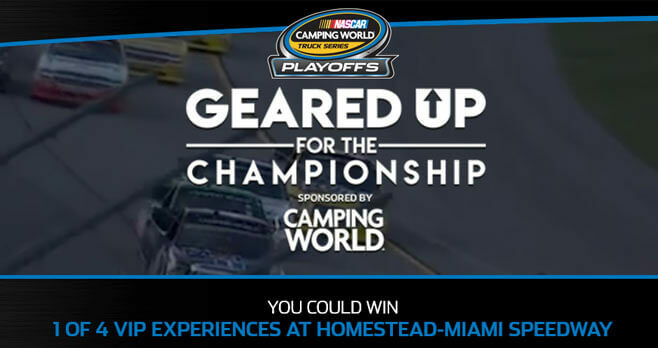 Enter the Nascar Camping World Geared Up For The Championship Sweepstakes by registering online at campingworldplayoffspromo.nascar.com and you could win 1 of 4 VIP Experiences at Homestead-Miami Speedway where you will also have the chance to win a brand-new 2018 Coleman Lantern 274BH RV. Eligibility: The Nascar Camping World Geared Up For The Championship Sweepstakes is open to individual permanent legal residents of the contiguous United States and District of Columbia, who are 18 years of age or older, and have reached the age of majority under the laws of the jurisdiction in which they reside, as of 8/21/18. Promotion Period: The Sweepstakes begins on 8/21/18 at 12:00:00 PM ET and ends on 10/2/18 at 11:59:59 PM ET. Limit: Limit one Grand Prize and one Weekly Prize entry per person and per e-mail address per day, regardless of the number of email addresses used. Prize(s): The grand prize consists of a 2-night trip for the Grand Prize winner and one guest to attend a NASCAR Camping World Truck Series, Championship 4 Race (currently scheduled to take place on 11/16/18) in Homestead, FL.